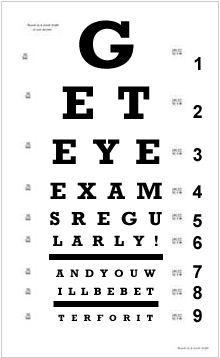 Icanseeclearlynow: February 2012 - Can I see clearly now? I’m sitting in the office of my optometrist, my lens fitter.. And I’m shouting like a little 6yrs old..
Erhm… well, can we wait?.. oh, they are in already… “wow ur pretty” , eh, I can actually see her in focus? WTF? Twenty minutes later I’m outside again and all (of-course) is back to being blurry… we had determined the “settings” of the first test lenses” and I should be able to pick them up the next Friday.. YES!!!! Oh well, it’s a start….